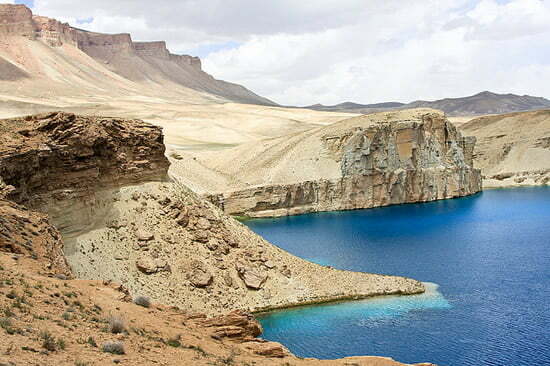 Band-e Amir is a chain of 6 incredible deep blue lakes nestled amidst pink limestone canyons in the mountainous desert of central Afghanistan. 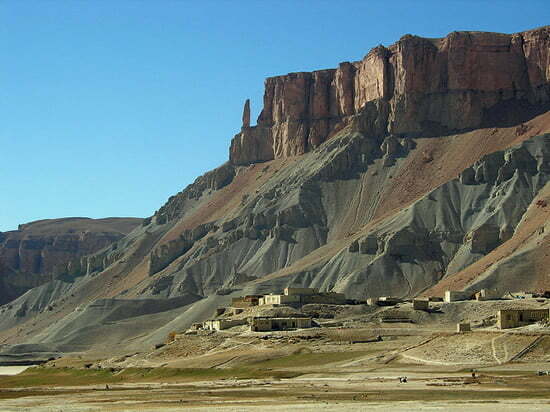 They are located high in the Hindu Kush Mountains, the second highest mountain range in the world, at an altitude of 2900 metres, and about 80 kilometres (42 miles) from the ancient town of Bamiyan, where the Taliban destroyed the world’s tallest Buddha statues in 2001. 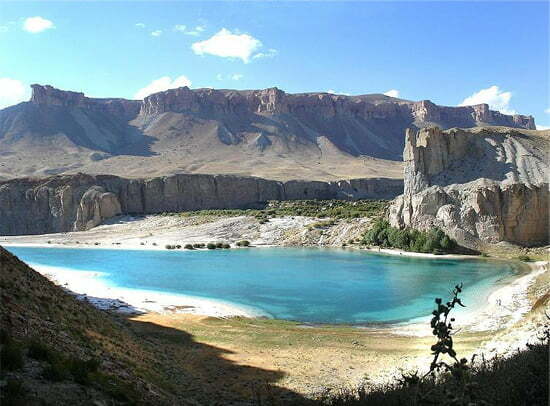 Surrounded by pink towering limestone cliffs almost in complete lack of vegetation, the stunning lakes have intense colors that range from faint turquoise to deep blue. Sometimes they are bluer than the sky and contrast spectacularly over the desert vistas around them. 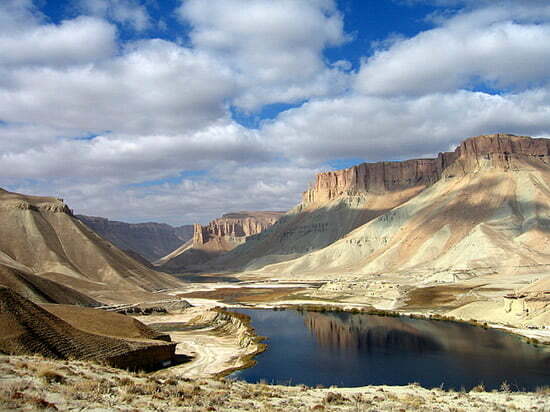 Together with Bamiyan, they are the heart of Afghanistan’s tourism, attracting a few thousands of tourists every year from all over the world. 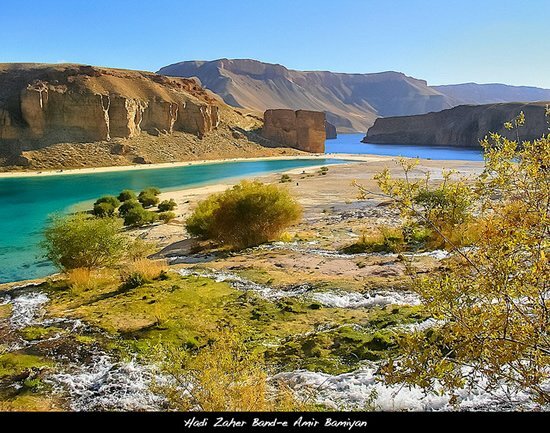 The lakes are separated by natural dams made of travertine, a mineral deposit and their names refer to their dam-like (“Band”) appearance: Band-e Panir is the smallest lake, with a diameter of approximately 100m (330ft), Band-e Zulfiqar is the largest, measuring 6.5km (4mi) in length, Band-e-Haibat is the deepest, estimated to have an average depth of 150 m, and Band-e Gholaman, Band-e Qambar and Band-e Pudina make up the rest. 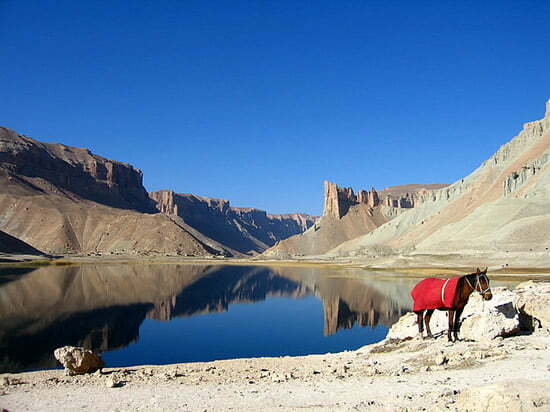 Covering approximately 230 square miles, Band-e Amir became Afghanistan’s first and only national park in 2009 and has also been nominated to be a World Heritage Site. 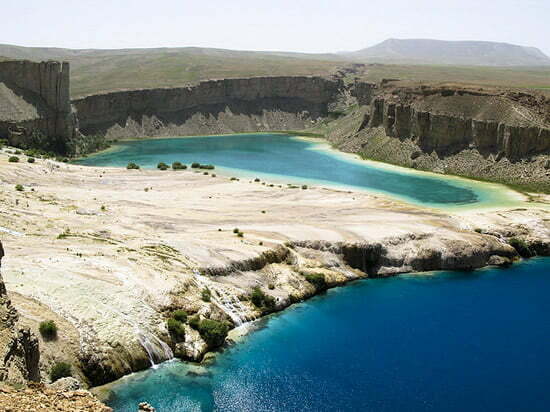 It is one of the few rare natural lakes in the world that are created by travertine systems, all of which are on UNESCO World heritage list. 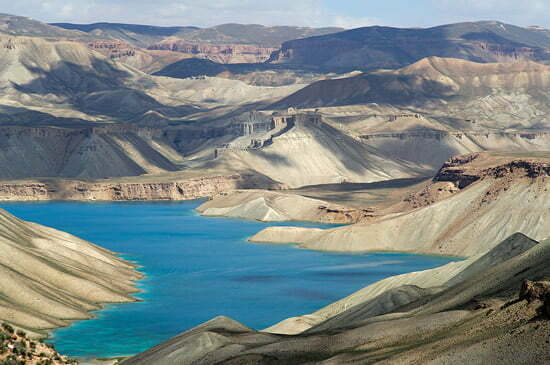 The beautiful lakes were created by the carbon dioxide rich water that is drawn from the spring melt-water in the surrounding mountains and came out from faults and cracks in the rocky landscape. This outflow of water percolates slowly through the underlying limestone, dissolving its principal mineral, calcium carbonate. Over time, the water deposited layers of hardened mineral (travertine), which created dams that trap water in increasingly large basins. 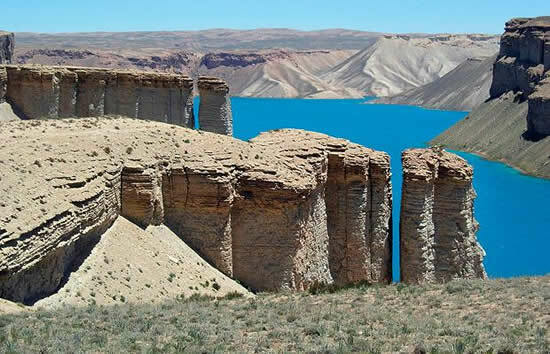 These dams are usually about 10m (33ft) high and 3m (10ft) wide. 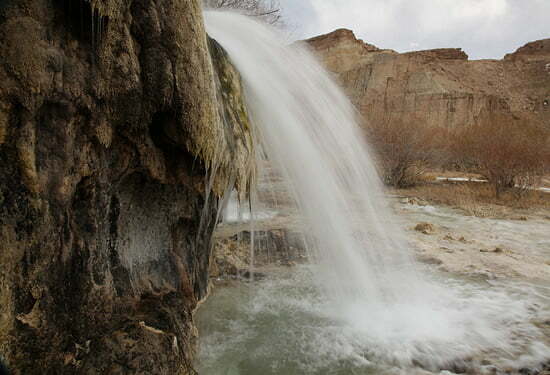 Water cascades from one lake to the other near travertine terraces serving as massive natural dams between the lakes. 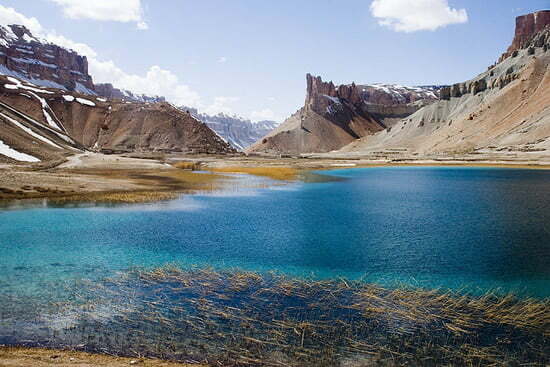 The high mineral content of the lakes are also the cause for the intense and varying colors of the lake waters. 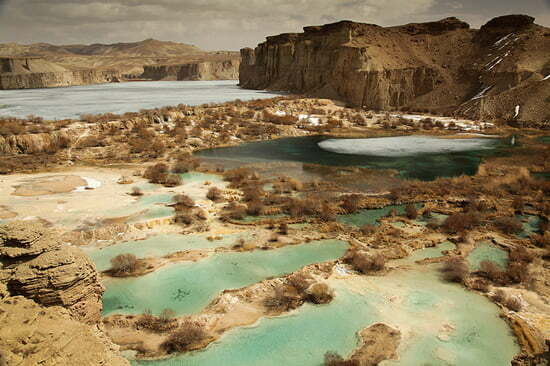 During the 60s, Band-e-Amir was an Afghanistan popular tourist attraction, visited by thousands of domestic and foreign tourists every summer. Today, the roads around the lakes are heavily mined by local militias and the Taliban, and traffic is restricted to only a thin dirt track that is cleared of mines and is considered safe to travel. Getting to this region requires a sense of adventure and determination. 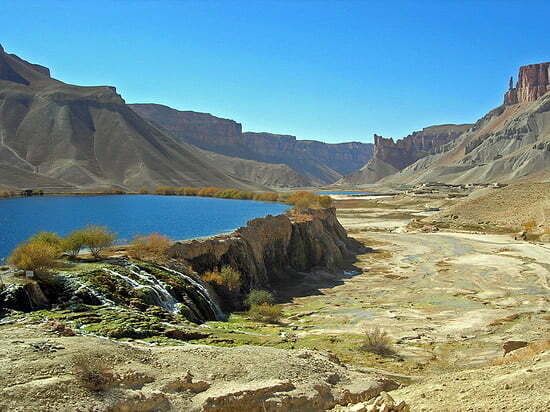 Travel from Kabul takes about 12 hours and it is most easily visited from Bamiyan on a 5-hour-trip on unpaved roads in harsh terrain and rocky plateaus that lack of basic facilities. Lack of a park maintenance authority has led to various environmental problems such as the increase of pollution through human waste and trash, damage to aquatic ecosystem because of fishing with electricity and grenades, soil erosion and landslides. 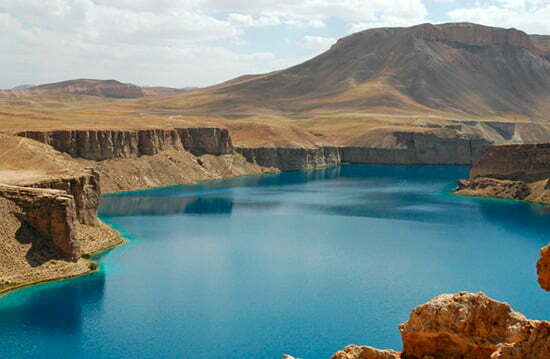 In 2008, the Afghan government banned the use of boats with gas engines on the lakes to decrease water pollution. With over 152 species of birds recorded, this national park has been designated an Important Bird Area by BirdLife International, but over the decades, large wildlife has disappeared from mountains surrounding the region. 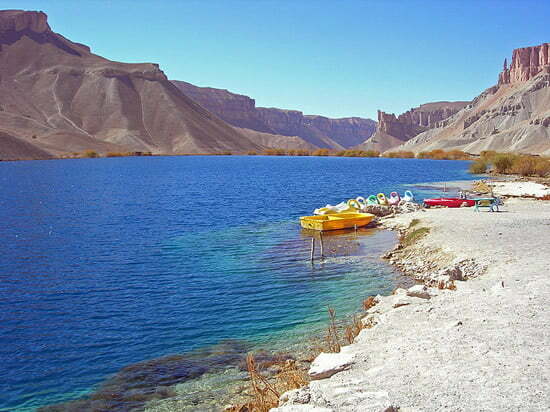 Band-e-Amir facilities include a ranger station, entrance gate, restrooms, and recreational paddle boats for rent. Hotels and guest houses can be found in surrounding communities. Swimming is allowed to men only, although this is limited by the incredible cold water fed by springs and snow melt. All services at the lakes close up around mid-November and reopen around March, as the region is extremely cold in winter, with temperatures reaching as low as -20C. Today these jewels are seen as the promise of a brighter future for a country striken by decades of war. 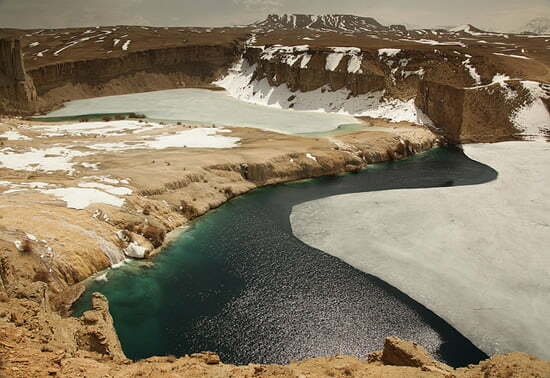 If planning to travel to Band-e-Amir Lakes, seek guidance from government authorities before making any travel arrangements, and stick to well-worn paths to avoid the mined ones.